Hey! Thanks for checking out my knitting patterns. Did you know I’m also an author and a fiction editor? My debut novel, The Other Lane released in July. My second novel, Ethan & Juliet comes out December 4th, 2018. The heroines in both books are knitters just like you and me! Click the ‘Books’ link above to find out more. This is mitten pattern I wrote up for my knitting class this week. They came out nicely. They are a quick enough project that you could knit them and still have time to wear them before winter is over! At the beginning of the next round, switch to ST stitch, adding one stitch on third needle. Next round, K to stitch marker, place stitches between marker on waste yarn, using backward loop cast on, CO 2 st on right hand needle, K to end. K until mitten measure 4” above thumb gusset or until mitten is 1.5” shorter than total desired length. K2together around, pull yarn through sts, and weave in securely. These are exactly what I’ve been looking for. Thank you for making the pattern available to us for free. Even though this has been a mild winter here in New England for us, I have some beautiful hand-dyed wool I want to use and this pattern will showcase the colors perfectly! I am so glad you got some use out of it. I would love to see a picture when you make you beautiful hand dyed mittens! As a Floridian , We usually have a mild winter when the temperatures do not go down to freezing. But there are times when it does and mittens are an important part of my work uniform. But chunky wool is too bulky for me. But worsted weight works for me. 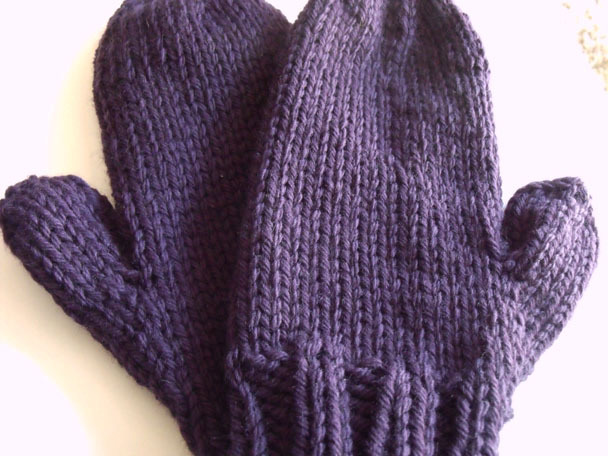 I use the magic loop method to knit the mittens since I can not master double pointed needles. Since the pattern is plain stockinette, the left and the right mittens are the same. Do you have a circumferance around the hand of the mitt? I would like to make one pair for my husband and another for my father but I am not sure how many extra stitches I should add to fit their (somewhat larger!) hands. Thanks!!! With 28 stitches CO and 4 stitches per inch, the circumference would be a comfortable 7 inches. I would measure your recipients hands (or someone of similar size if the mittens would be a gift) and then add 4 stitches for every inch above 7 inches their hands are. Keep in mind for every inch in circumference you add, you will need to add another increase in the thumb gusset so the thumb is large enough. Thank you for posting these. I tried a similar pattern that was incomplete and I am so happy to find your pattern, it’s been so cold I want some warm thick mittens “now”! When you say “At the beginning of the next round, switch to ST stitch, adding one stitch on third needle.” does that mean you have to M1 at the last stitch? Or what does that mean? That means increase by one stitch in your favorite method somewhere in the final third of the stitches. 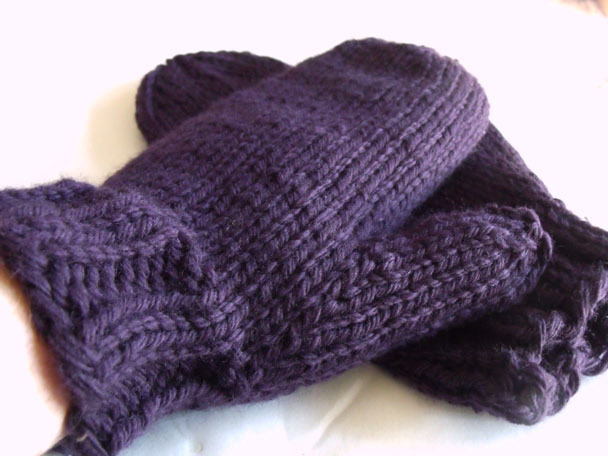 do you have a pattern for easy knitted mittens using circular needles? Are you looking for projects on two circulars or on magic loop? These mittens are easily adapted to either technique, simply split the number of stitches in half rather in thirds. I also find it helpful, when knitting mittens on circular needles (I prefer magic loop) to keep thumb gusset at the end of the first needle. Would this be the kind of thing that would be helpful to see in a video? Funny you say that, videos are one of the things I am working on behind the scenes. There will be a link on this page as soon as I have it done. so to make a smaller size (kid ) would you decrease by 4 sts also and adjust other numbers. It would depend on the size of the child. For a baby, I would use my baby mittens with no thumb, for a toddler, I would scale up from there. 22 stitches for a toddler, 24 for everyone else. Of course, your best bet is always to measure the wrist and knit to gauge. When you say “increase in this manner until you have a total of 9 gusset stitches” could you elaborate? In between the place markers I continue to M1R and M1L and knit in between each round? Or every other round? Thanks. The pattern says to increase in this manner every third round until you have nine stitches. So after the first gusset increase round, you’ll knit two rounds even, then on the third round, work the increases again. Hope that helps! Hi, I’m possibly missing something obvious here, but I’m just wondering how to go about casting on 2 stitches to the right hand needle after slipping the gusset stitches onto scrap? This is my first project knitting in the round so it’s all very new to me, and I’ve only ever done knitted or cable cast on before. Any help appreciated, thanks! After you remove the stitches, use the working yarn to cast on two stirches using the backward loop cast on. This should help close the gap left by the thumb gussett stitches just removed. Where it says “knit until mitten measures 4” about thumb gusset” does that mean knit until mitten measures 4” above thumb gusset? Thank you! Yes it does! Thanks for pointing out the typo. I will get it changed. First off let me thank you for sharing your talents and your time and giving us this free pattern. I was wondering if I could add a suggestion? For your beginning cast on, when you say divide evenly I did not come up with the same idea you did, I did 9, 9, 10 thinking of trying to be as close to even as possible in that even around. I would suggest maybe putting in your pattern that you do 8, 8, 12. I did not learn this until I found your video after reading through all the comments as I was not quite sure on some of your instructions until I found others had the same. I would also suggest in the written pattern to put backwards cast on loop, i had no idea how to cast on the right needle and was not sure what you wanted, but thankfully answered in comments. The only problem is not everyone will read through the comments. When doing the 9, 9, 10 ratio I did not like where my thumb gusset sat and sadly before I realized it, I ended up somehow with more stitches so ended up frogging it right back to the top of the cuff and than reorganized my needles to your 8, 8, 12 and started over keeping an eye on each step of the video. I like written patterns and appreciate video tutorials, personally however it would have been nice to have the pattern include the things I mentioned above. Please know this said with respect to your work and only offering as a suggestion. Thank you again, for all you share. What size is your pattern for? I’m looking for something that would work for my 5 year old grandson. Thanks! This pattern is for an adult medium mitten.